On August 17th 2014 The Kei’un-kai Memorial Performance, including INI members, took place at the Kongo Noh Theatre in Kyoto. It was a long day, with shimai, rengin, maibayashi and full Noh plays performed from dawn to dusk. This year’s performance took place at the end of the o-bon period in Japan, during which people remember and honour the dead. It was an occasion for us performers and for the audience to express gratitude to those who are not with us anymore. For this purpose, Udaka Michishige has chosen a poem by Henjo (816-890), quoted in the Noh Sumizome-zakura, ‘The Ink-dyed Cherry Tree’. “Everyone is wearing colourful robes, while my mossy sleeves (a monk’s robes) are yet to dry.” Henjo became a priest after the death of Emperor Nimmyo, and the poem expresses the poet’s grief and his reluctance to return to colourful robes after the official time of mourning, though others around him have done so. 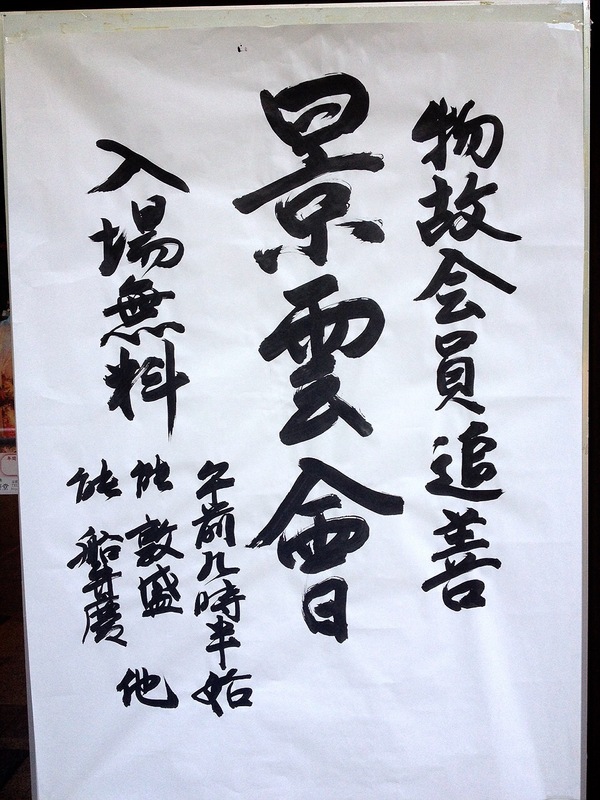 Udaka Michishige created a calligraphy with the first line of the poem, which you see on the hanging scroll in the picture below. Rebecca Teele Ogamo. Calligraphy: Udaka Michishige. Kakejiku hanging scroll: Kim Heakyoung. The INI Senior Director, Rebecca Teele Ogamo, would like to share the following thought about the performance: ‘It was very special to remember both those we once performed with us as Keiun-kai or INI members and those who have supported us in the past and I think we all felt their warm presence cheering us on. And perhaps they were in “flowery robes” as they watched with nostalgia our struggle with the nerves and doubts that sometimes clouded our vision’. The INI would like to thank all those who have participated to this performance, and whose help and support motivates us to continue our study and research of Noh. This entry was posted in Events and tagged Atsumori, Funa Benkei, Kei'un-kai, Kongo, Kyoto, maibayashi, Noh theatre, performance on 23/08/2014 by inikyoto. Address: 111 Satsuta-cho, Kami-Takano, Sakyo-ku. Kyoto, Japan 606-0047 TEL: (075) 701-1055 Travel directions: Subway: Kokusai-kaikan station, 7 min walk. Bus: Miyake-cho bus stop.